Everyone loves smoked meat stuff, especially a smoked bacon! 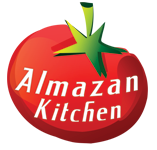 Even better if it’s Almazan Kitchen smoked bacon recipe! Prepared with help of our main chief – Mr. Ramsay the Owl. He’s very stubborn and doesn’t like some of our cooking methods, but in the end we always come to conclusion. Still, he’s very cute and loves the meat we take to cook. Don’t have a smoking pit? No problem! If you are a BBQ lover and enjoy nature’s beauty, this video recipe is something you shouldn’t miss! Take a grinder, add 1/2 tsp. salt. Add 1 tsp. brown sugar. Grind it well, pet the Mr. Ramsay. Add 1 tbsp. chili sauce. And add 1 tbsp. ginger paste. Add 2 tbsp. dark soy sauce. Let Mr. Ramsay try it for the consistency. Mix again, and let the Chief Owl try it again… He’s not satisfied… as usually, but let’s continue. Take the meat out, and let our Field Chief try it… Told ya! It’s an outstanding slice of meat. Deep 500g bacon in the sauce. If you’re cooking this out in the nature, get some anti-insect flowers and apply the insecticide. If not – skip the step. Refrigerate until the smoking pit is ready. Build a small well with the stones, do not use the wet ones, it can be dangerous. If you’re not sure they’re okay and wet only from outside, not from inside, then just spend some more time to find dry ones. Ignite the fire in the stone well, let it burn until coals left. Place the bacon in the grill cage. Add wet leaves into the pit. Place the cage with bacon above the pit, cover it with clay pot. Cover the pit with huge leaves for isolation. Wow what an amazing video!! Hi! We are from Serbia. Hi and thx! At the moment the blog is in development, soon it will be a place where you can know a lot of interesting details about every video recipe that we post on youtube. We will also make a section about homemade ingredients that we use and how to make them and much more. Molim vas, recite mi gdje se moze vas noz kupiti koji uvek koristite da secete meso? Tako sam ga dugo trazio a nikako da ga nadjem. .
Where did you guys purchase that squared Mocajete? Absolutely LOVE your cooking videos. I’m ready to move to Serbia. 😍 Keep up the great work! Just watched your whole fry chicken video. Wow that is on the menu here toot sweet. Even have horseradish in the fridge. I am going to check out everything on your site. Such a treat, great job, good on ya, and thanks. Have a black bear hanging to butcher today and will use your marinate recipe for the bacon. In Serbia are common people allowed to hunt? I am in Canada we are very fortunate to have this privilege. I’m also interested in where I can get a morter and pestle like that at! !